Over the last few months, Mayor Herman Mashaba has been communicating his vision for accelerating the rejuvenation of Johannesburg's inner city. He has met with business people and property developers and challenged them to turn the CBD into a construction site. He has committed to tackle corruption and improve the enforcement of the city's by-laws. He has said all the right things about harnessing heritage sites and reusing old buildings. As a result inner city enthusiasts (and I'm sure many residents and workers as well) are feeling a new wave of optimism. It is going to be fascinating to watch the changes that occur in the coming years as the new administration tackles huge challenges in a complex environment. Many of the projects featured in this piece were already in motion before the new administration took office. I hope to see a solid acceleration of activity (sensitively approached of course) in the coming years. (Note: As many structures in the inner city have cultural significance and/or are older than sixty years the Provincial Heritage Resources Authority Gauteng (PHRAG) will need to increase its capacity. If not there may be a bottleneck of applications or more worryingly the PHRAG may be bypassed. This will be one to watch). Below are a number of projects I have spotted on recent walks around parts of the inner city. As the title of the article suggests this is not a full round up of activity. I have also included some updates where construction has yet to begin and highlighted projects and initiatives that various enthusiasts would like to see happen as part of rejuvenation efforts. If you have any updates or corrections please email jamesball01@gmail.com or comment below the article. There is a lot happening in the Carlton Centre Precinct at the moment. Sky Rink Studios on top of the parkade located on Main Street where the Carlton Ice Rink used to be is set to provide a major boost for the area. In addition to the high tech film and television studios the project will include a conference centre and post production facilities. City officials and the entrepreneurs behind the project believe the studios will attract further investment into the precinct. At a recent sod turning ceremony for a new hotel at Melrose Arch, Mayor Mashaba publicly challenged developers to take on the iconic Carlton Hotel. As mentioned in previous articles on the inner city, bringing the Carlton Hotel back to life (not necessarily as a hotel) would be one of the ultimate symbols of rejuvenation. The company that succeeds will certainly etch its name into the history books of the city! There are rumours that Transnet is planning to sell the building. I am holding thumbs that the rumours are true and that something happens on this front soon. Diagonally across from the Carlton Centre (to the north east), the Falks Lighting Building (old Gladstone Hotel circa 1905) has been revived. A swish Street Fever shop has opened at street level. It appears as though the upper floors have been converted to apartments. To the west of the Carlton Centre, workers are on site at the Motsepe Building and the Trust Bank Building. I am not sure what is planned for the former but the roof structure looks quite substantial (see pic below). It appears as though a Government Department will be taking up space in renovated parts of the Trust Bank Building. 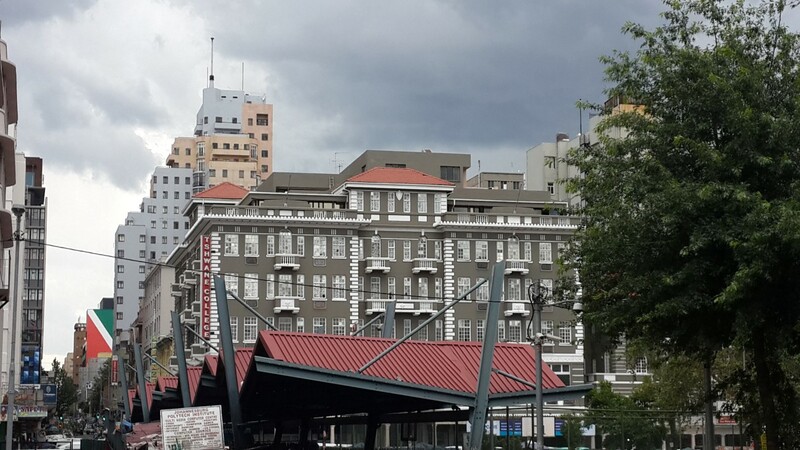 Substantial roof structure at the Motsepe Building (The Heritage Portal). It is great to see that on Saturday mornings a small market operates in the pedestrianised section of Fox Street between this building and the Carlton Centre. A short walk towards the south west from the Carlton Centre precinct is the Marshall Street Barracks (85 Anderson Street). For a while the heritage community was feeling quite pessimistic about the lack of progress on the development that planned to tie old and new together. Thankfully the heritage consultants on the project have confirmed that there are still plans for the site. This is hugely important as the building in its current state reinforces all the negative stereotypes about downtown Joburg. Click here to follow progress. In the heart of the city the massive multi billion rand Kopanong project is moving along behind the scenes. The plan involves refurbishing, adapting and restoring 21 buildings. Top heritage consultants have been commissioned to put together guidelines for the project and it is expected that these will be submitted in the next month or two. It may be a while before we see action on the ground but at least we know things are happening. As discussed in previous articles, this investment by the Province is a gamechanger for the inner city. There seems to be no way to force Urban Ocean, PHRAG and the City of Johannesburg to take action. They betray heritage through pursuing and or / permitting demolition by decay. It undermines our city and creates something horrible in our midst. On a more postive note work continues on the Rissik Street Post Office. Bringing one of Joburg's icons back to life after so many years of crisis will be a massive shot in the arm for rejuvenation efforts. A building in the centre of the old financial district that looks like it will receive a new lease on life is the Consolidated Building. It appears as though PHRAG approval has been given for the conversion of the building to apartments (reasonably upmarket units). The nearby Victory House (circa 1897) looks like it needs some serious care and attention. It was sold at auction a few years ago but I have seen no improvement since then. The Natal Bank Building (the oldest surviving bank building in Johannesburg) and the Guildhall (oldest surviving pub although it is not operating at the moment as far as I'm aware) are located opposite the Gauteng Legislature / diagonally across from Beyers Naude Square. Natal Bank is receiving some attention but nothing major according to sources on the ground (just some painting and cleaning). I have not heard anything about potential tenants. [Jan 2017 - see comments section below for details from the owner revealing the full extent of the work happening on Natal Bank] The Guildhall is a bit of a worry as it appears as though the work going on is illegal. Apparently the owner wants to bring a major restaurant chain into the building. Definitely one to watch. Moving towards the Retail Improvement District and High Court Precinct there is quite a bit happening. Check out this recent article on Pritchard Street for full details. The most significant project is the adaptation of four historical buildings (Dunvegan Chambers, the Royalty Building, Hilson House and Cuthberts) to form the Chambers of Change development. The Inner Court building is also being refurbished. A quick walk from the Retail Improvement District towards Park Station reveals a few refurbs on the go. Buildings that looked weary just a few years ago are looking vibrant today including the Tower Building and Hi-Riagan Court. I noticed an increased JMPD presence in the area compared to previous visits. A quick chat with a few officers was quite inspiring. They spoke with passion about making sure the area was clean and safe for children to play and for people to go about their business. I didn't get to explore the full extent of the Park Station Precinct this time round. The vision for this part of the city is a big one with hotel, office, retail and residential opportunities. To the west of the city, work continues in Newtown with a number of projects on the go or reaching completion: the Market Theatre's development on the eastern edge of Mary Fitzgerald square is almost finished; Atterbury is erecting a new showroom for Ford across the road from Newtown Junction; and residential housing is going up opposite old Park Station (alas I haven't heard anything about what will happen to this landmark structure in a while). The state of Museum Africa is still a major concern. It should be a must visit destination for every tourist and local in the city. The fact that previous administrations let the situation become so serious is scandalous. To the east of the inner city Maboneng continues to thrive and expand. It will be interesting to see what kind of an impact Hallmark House has on the area now becoming known as Maboneng North. Unfortunately no optimism surrounds the state of the Three Castles Building located to the east of the Barclays/ABSA precinct and a short distance from Maboneng. It is an absolute disgrace that the building has been left to deteriorate as it has. The company that owns the building was dissolved a few years ago. Where this leaves the building who knows. For a while it looked as though the City of Joburg was trying to take ownership of the building but it appears as though officials pulled back when a private enterprise took up the task. These efforts came to nothing and the city hasn't re-entered the fray (yet). If you have details of projects happening in the inner city please email jamesball01@gmail.com and I'll include them in the next 'Inner City Snapshot'. Thank you to Brett McDougall, Brendan Hart, Yasmin Mayat, Jacques Stoltz and Brian McKechnie for their assistance on this piece.